For those who love the freshness of local food and the concept of supporting the growth of more small farms in the area, then this event is for you. Farmer Teresa Retzlaff—Owner of 46 North Farm in Olney—will be the presenter for our monthly food and wellness talk “Beers to Your Health” at Fort George Brewery. Retzlaff’s talk will focus on things you can do, big and small, to help change the way food is produced and consumed in our region. Retzlaff says there are ways we can all support local farmers and grow the local food system; such as thinking about what “local” means, eating seasonally, and learning about how your food is produced. For example, ask questions about where your food comes from when you go out. “That lets the restaurants know that you care. That’s why more farms are getting inquiries from restaurants, because their customers are asking questions. Consumers have so much power,” Retzlaff said. Retzlaff hopes everyone can try and shift some food purchasing to local and support people who are trying to grow food in our coastal area. 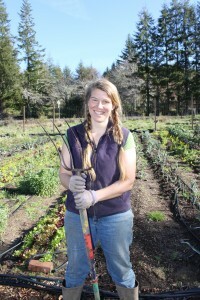 Retzlaff’s local food presentation at Beers to Your Health happens on Thursday April 14 at the Fort George Lovell Showroom in Astoria (corner of 14th and Duane) at 7 p.m. Doors open at 6 p.m. and food and drinks are available from the Taproom. The event is free and open to all ages. This entry was posted in Classes/Events and tagged #beerstoyourhealth by Zetty Nemlowill. Bookmark the permalink.